Have you ever ordered a stamp set and then forgot that you had it? Then when you realize you have it....it feels like Christmas! I bought Amazing Congratulations back in February and am just now getting around to using it for the first time. I am glad that no one chose it as a prize for my BINGO event . I am so happy that the sun is shining and spring/summer is certainly in the air. My body was craving natural Vitamin D after all the yucky germs that seemed to cling to me like velcro this winter. and into early spring. whisper white stampin up cardstock cut at 5 1/2" X 8 1/2" and scored at 4 1/4". whisper white stampin up cardstock 4 X 5 1/4"
1. Fold scored base in 1/2 and set aside. 2. Stamp Congratulations from Amazing Congratulations in Pineapple Punch. It is a 2 step stamp set, but I did not try to create any shadowing effect. I went from the pad to the paper. A hint....I got better coverage when I turned the pad upside down and actually applied ink to the stamp. Then stamp the little one in the archival basic black. 3. 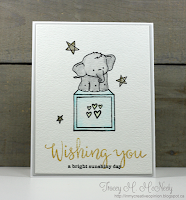 Ink Bella up using the archival black stampin up pad and stamp on the whisper white. 4. 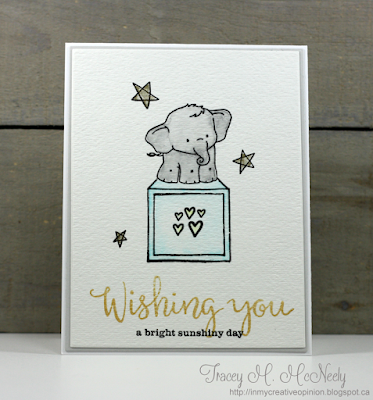 Color with stampin blends markers. Please see product list below and the photos for correct marker color. 5. Using the clouds from the Up and Away thinlit die set, cut 2 small clouds and 1 medium size. I placed mini popup dots on the backs of the clouds to give it some dimension and texture. 6. Adhere to the whisper white card base. Over at Muse Card Club, Challenge #267 started on Monday. I fell in love with the card. I was very inspired by the colors, the big words at the bottom and the idea of using an cute animal. Thanks so much Tracey for the inspiration. I am going to talk about the Color Revamp over several days because it can be a bit overwhelming, exciting and sad. Today, I want to share with you the new incolors that are coming aboard in the 2018 catalog.